I must admit that my wife and I had twinges of trepidation as the day of this walk approached. I had estimated it to be 12 miles and but have been getting a reputation for underestimating the lengths of our walks (this one turned out to be over 14 miles). Our 9-year old twins had never walked that far before; nor, I found out afterwards, had my wife. There was no cut off point to the walk. If they got tired, things could go rather wrong. My Aunt Jenny came with us to assist in the event of a catastrophe. As it turned out, we need not have been concerned. About half way through the walk, the exhausted adults realised that their concern should have been directed more at each other than towards the children. At 13 miles my daughter announced she could go another 10. When we then finished, my son announced he wanted to walk back instead of call a taxi. The walk started in Cliffe, where we first had to retrace last week’s steps by over a mile in order to get back to the coast. 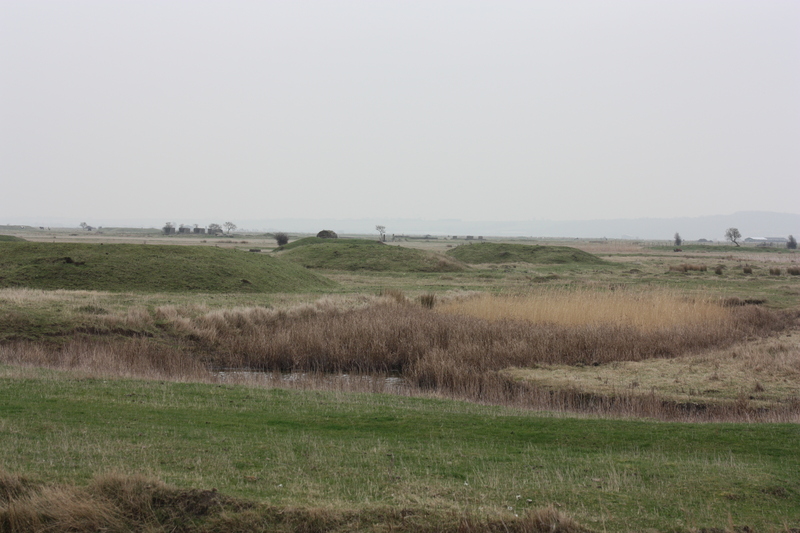 As soon as we reached the sea wall at Cliffe Creek we saw rather a strange sight. Had this been maliciously intentional? Accidental? Or just a simple exercise in dumping? I suspect the latter. The banks of the Thames in this area do seem to attract rubbish. 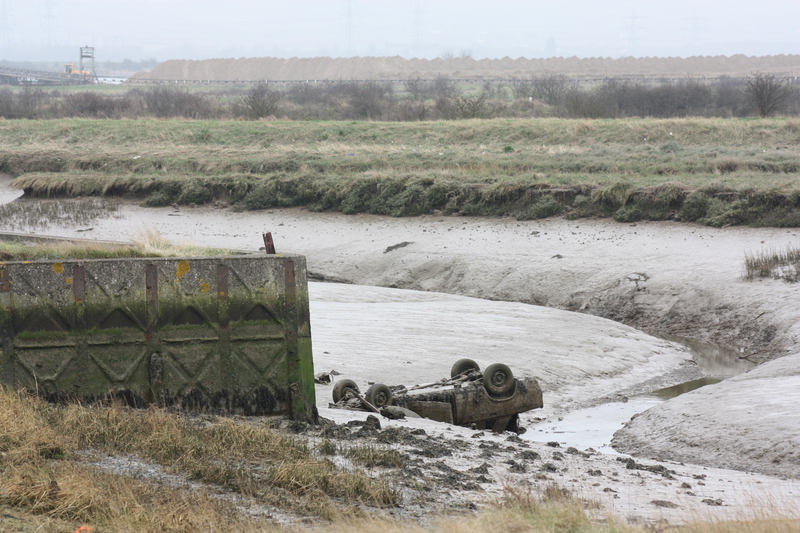 This was not the first example of an abandoned car, half-submerged in mud, that we had seen. Having reached the sea wall again we turned north. After a short while we started to see grassy mounds ahead of us, looking like giants’ pillows, or maybe hobbit holes. 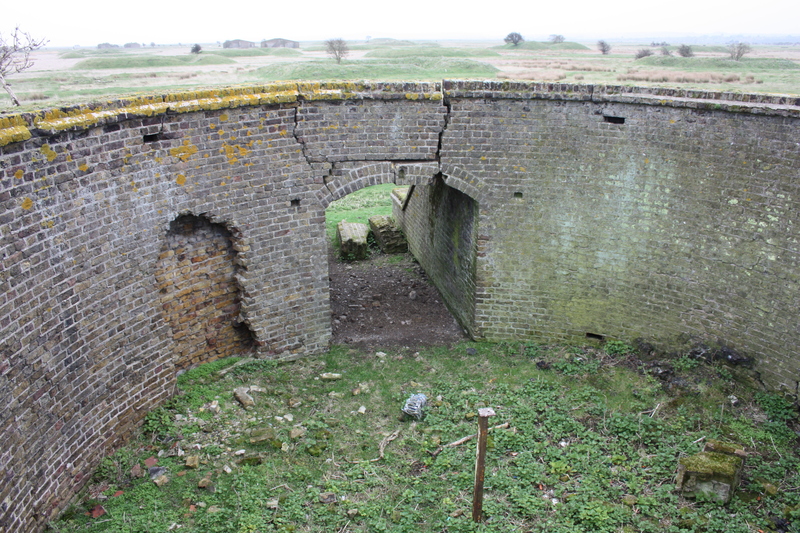 In fact, we were reaching the ruins of the Curtis & Harvey explosives factory which made highly dangerous nitroglycerine as well as other products when it operated, between 1901 and 1921. The site is 60 acres in total, and needed to be of a large size, as making explosives in those days was a dangerous undertaking. It was split up into individual buildings, each of them spaced away from the others, so that if there was an explosion in one building, it would not set off a chain reaction. In addition, the buildings were all very specifically constructed. The walls were brick, and many were earthed in – it was the piling of this earth around the walls that gave them the appearance of hobbit holes. The reason for the earthing in was of course to strengthen the walls, so that in the event of an explosion the blast was forced upwards rather than outwards. The roofs were made of timber, a weaker material than brick, so as to offer the path of least resistance to the blast. Many, though not all, of the buildings were circular, and presumably this design provided additional strength to the walls. Accidents at this site were not uncommon. There are various incidents recorded, but the biggest disaster here seems to have been on the 18 February 1904, when an explosion killed five workers. This explosion followed two others in the same month, and a government enquiry was set up. The factory continued to operate until 1921, and during its 20-year history a total of 16 people were killed by explosions. The factory was used as a bombing decoy in the Second World War, but now lies peacefully in ruins. It is fascinating to explore, particularly from the sky. A look at Google Earth will explain why (there are co-ordinates at the end of this post to copy and paste into Google Earth). 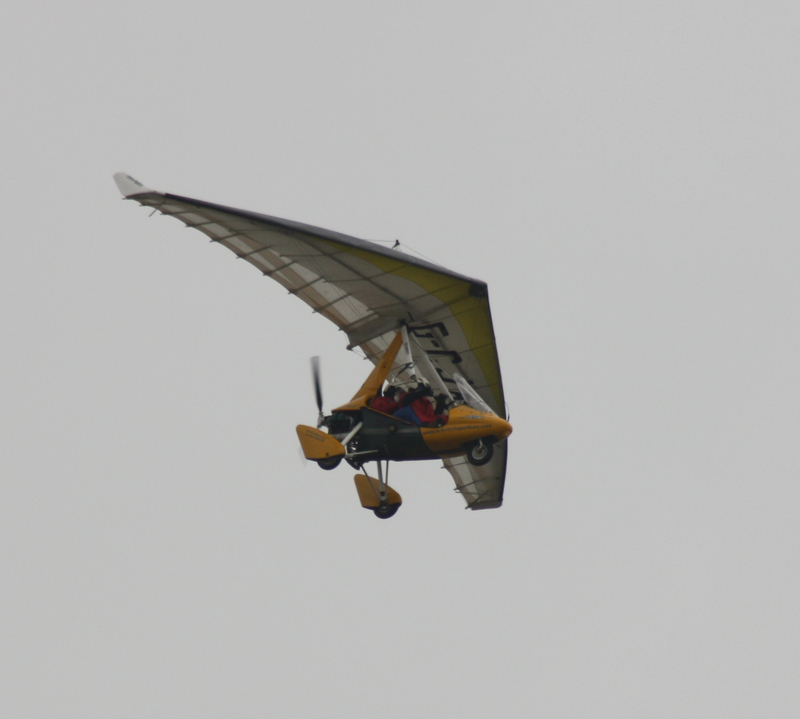 Whilst we were in the area a microlight was exploring from the air. The pilot saw us waving as he flew overhead. He turned back, cut back on the engine and went into a shallow dive. We heard the wind whistling past his wings before the engine roared to life again and he flew on. Conscious of time and the distance we had left to walk, we left the factory ruins and continued north, reaching Lower Hope Point. Here there stands a monument marking the eastern boundary of the jurisdiction of the Company of Watermen and Lightermen of the inner Thames. The lightermen were barge operators who ferried cargo between ships and quays, whilst the watermen ferried passengers. The Company of Watermen and Lightermen was formed in 1555 by an Act of Parliament. A “City Company Without Grant of Livery”, it is the only ancient City Guild to be formed and controlled by an Act of Parliament. It has its own hall, Watermen’s Hall, on St-Mary-at-Hill in the City of London. The boundary stone today is at an angle and barely readable. It would be good to have it restored. 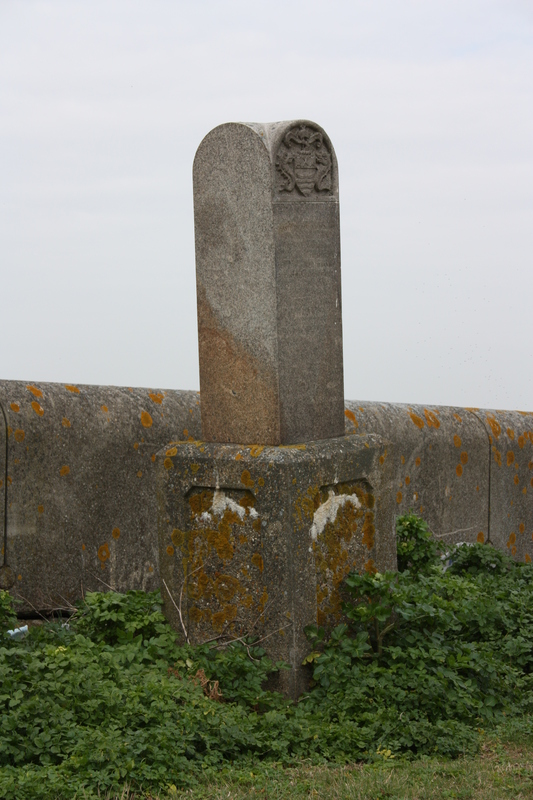 At Lower Hope Point the path turns northeast and then east, continuing along the northern edge of the Hoo Peninsula (Hoo is an Old English word meaning “spur of land”). At this point the walk is a plod. 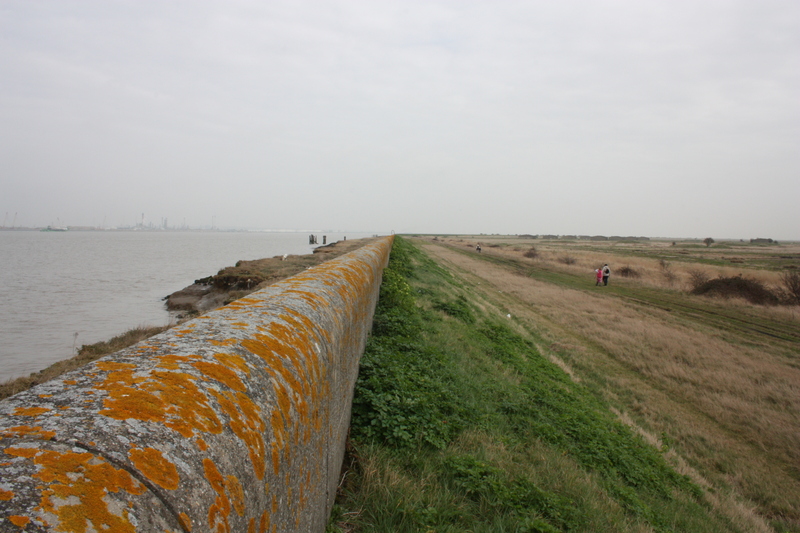 The sea wall is raised by an embankment, and there is no track on the Thames side. The track on the land side is at the bottom of this embankment, so that there are no views to the river and its activity. 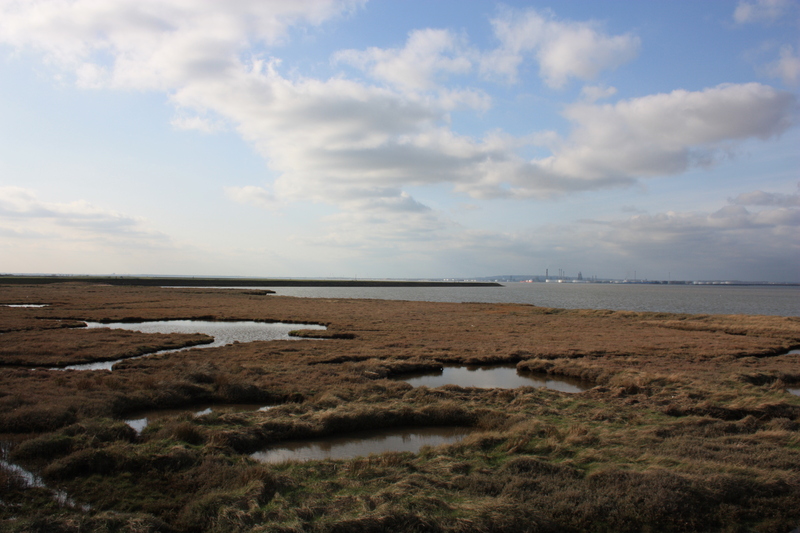 This was a pity, as we enjoyed looking across the River Thames to Coryton and Canvey Island and remembering where we had walked just a few weeks before. Luckily, after a while, the wall came to an end and the path then followed the crest of the embankment, allowing us to take in the views. At about the same time, the sun burned off the cloud and brightened up the day. 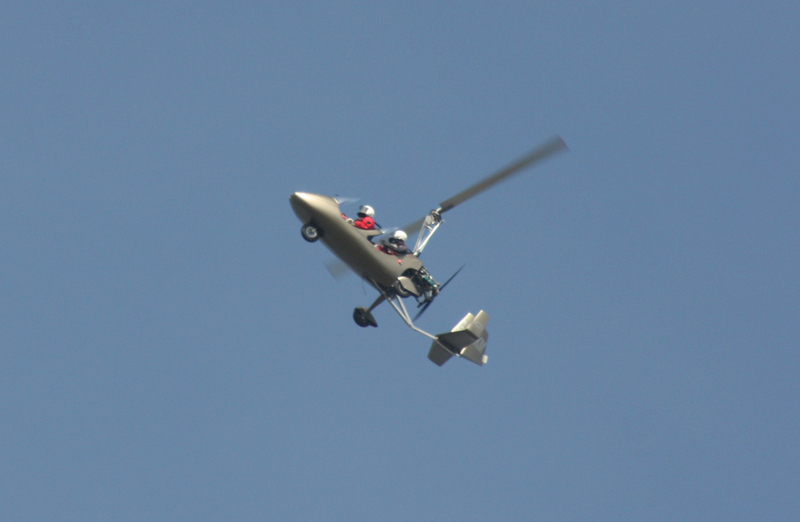 Another micolight flew overhead and after a couple more miles we reached the start of another sea wall. This time, the embankment was smooth and shallow, made up of what seemed to be fresh earth, so it was possible to keep walking by the sea wall itself and enjoy the views. To the other side of the path was a small river with reeds. The Thames was beautiful; the peaceful river with its reeds with beautiful; the mud track dividing the two on which we walked was not! Still, it was easy tramping on a long walk. As we walked on we looked at the coast opposite, beyond Coryton, beyond Canvey Island, and over to Leigh-on-Sea and then Southend. 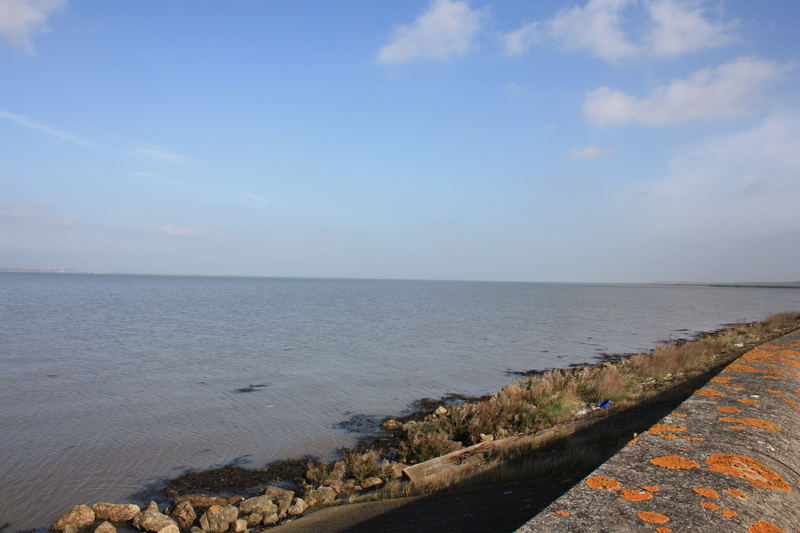 At last, after months of slowly walking inland along the northern bank of the Thames, and then slowly back out along its southern bank, we had a view of open sea. 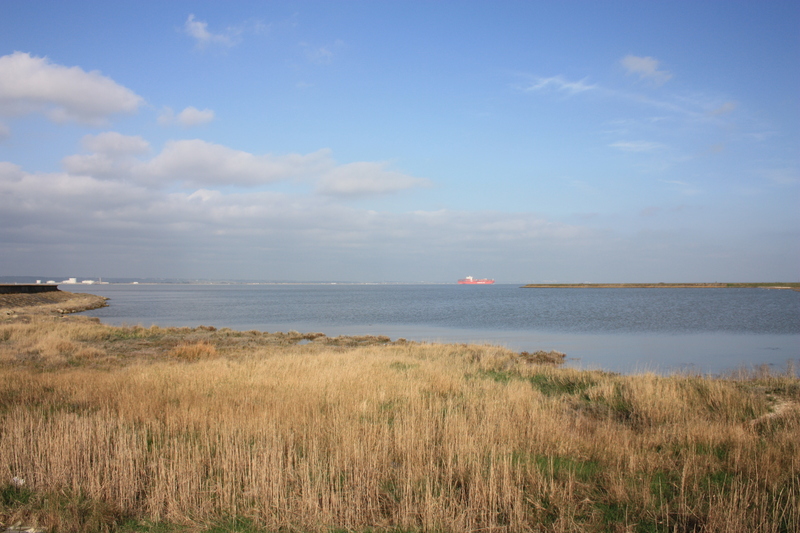 I reflected that although we were doing “the coastal path”, all we had really done so far was the Thames Estuary. 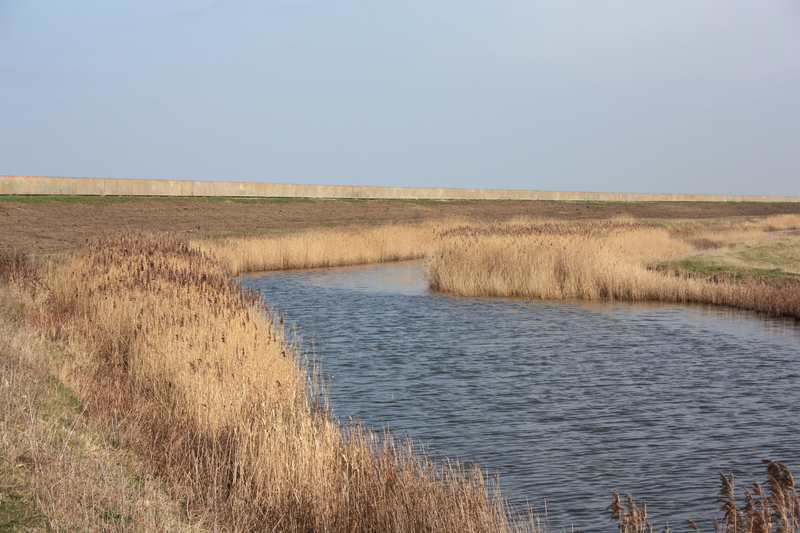 I also knew that during the next few weeks, months even, we would be looping back round to get off the Hoo Peninsula, and would also have the Isle of Sheppey to navigate before we truly came to coast and open sea. The view today teased us with a view of what we really wanted, but what we would still have to wait for. We continued onwards, reaching Egypt Bay. This is a slightly strange name given its location, and nobody really knows how it came to be called this. However, the main contender for the explanation lies with the fact that Phoenician artifacts have been found in Hoo. In 1903 a coin dating to the reign of Alexander the Great’s father, Philip of Macedon, was found. It is believed that Kent had a trading relationship with the Phoenicians, who came from Canaan, next door to Egypt. This explanation as to how Egypt Bay got its name is tenuous at best, but it is the only one offered. As we rounded the bay, we saw the Santa Catarina, the sister ship of the Rio de Janeiro, heading out to sea. Egypt Bay is otherwise best known for its prison hulks. These were ships used to house prisoners from the Napoleonic Wars, aswell as other convicts. It is the home of Magwich, the escaped convict from Dickens’ Great Expectations. The prisoners were kept in dreadful conditions, and malaria was rife. The hulks were eventually abandoned and there is no sign of them today. Almost immediately after Egypt Bay we reached St Mary’s Bay, and then, finally, we were on the home stretch to Allhallows-on-Sea. I had by now realised that I had underestimated the length of this walk. Thus, whenever I was asked how many miles we had walked, I glanced at my GPS and responded with our actual mileage less 10%. Each time my replies were met with comments about how various muscles were insisting that the owner of those muscles must have walked further than that; I feared if I gave the actual answer I would be thrown into the sea. Alas, the walk decided to throw in one final test: the Dagnam Saltings. 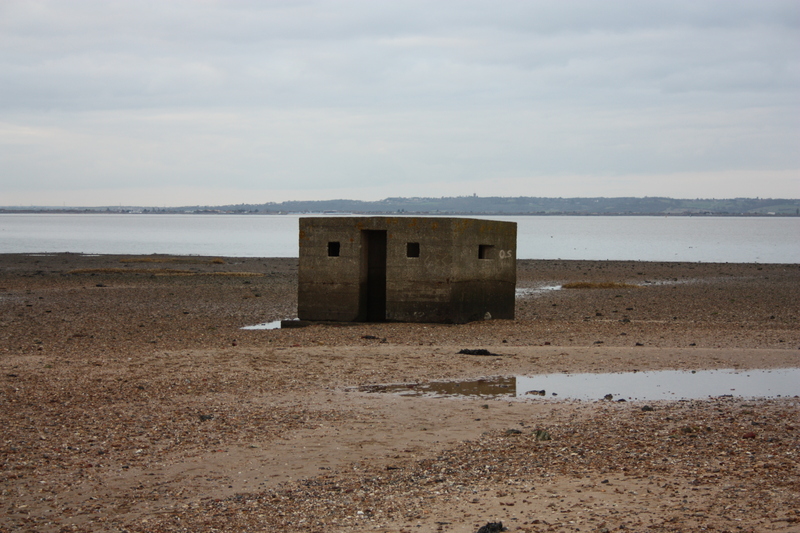 This is a marshy area leading out to some gentle flats, in which two pillboxes stand, one half-submerged by the sea. The path goes right through the middle of the saltings, according to the map, but finding this path on the ground is another thing altogether. We managed to navigate our way over the right style to the right path, but immediately took a wrong turn when this path became indistinct. What happened next was 15 minutes trudging through boggy marshland. Every now and again a cry would be heard, signalling that one of our party had been treated to a boot full of water. Eventually we found the path again, but the problem was that a ditch lay between us and it. We found a length of wood and hauled it over to make an unstable bridge, and with that we made it across to the path. My son in particular enjoyed this part of the walk, and people getting boots full of water. My wife has since described her feelings at this point of the walk as “muted near hysterical”. 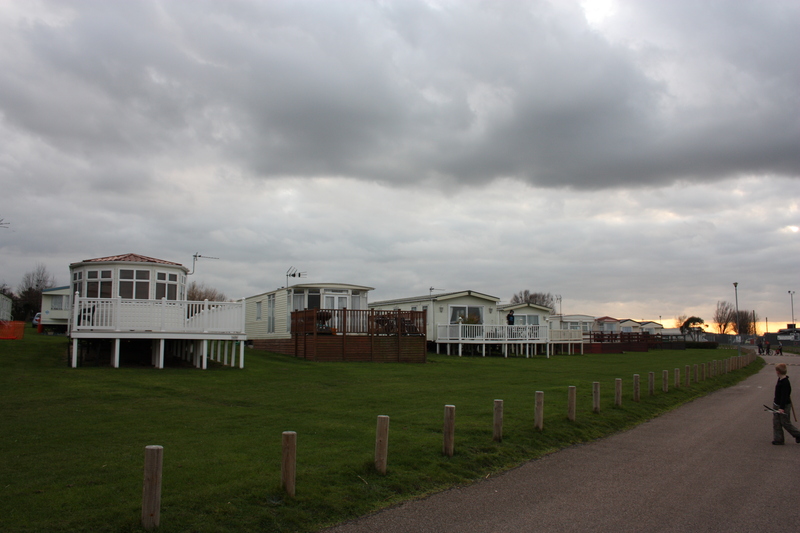 Our final task was to walk through the Allhallows Leisure Park, which is in effect a caravan holiday park. It was good to have firm ground under our feet. 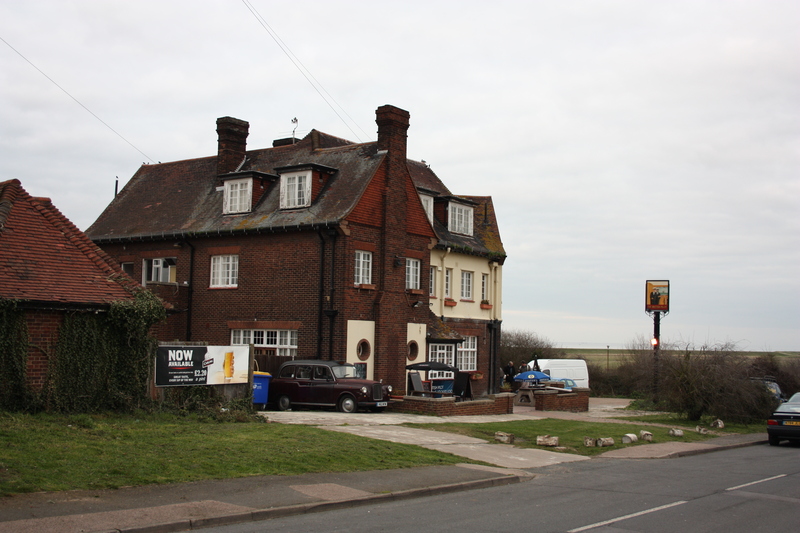 Once through the caravan park we made our way to the British Pilot pub where, over the course of the next half hour, we tried in vain to find a taxi company willing to come out to Allhallows and pick us up. Eventually we gave up and headed for the bus stop, aiming to get a bus to Strood or Rochester from where we could then get a taxi back to Cliffe. This would have been a terrible journey, and so it was with great relief that just before the bus arrived I managed to find a taxi firm who would come out and get us. We had covered 14.39 miles. The kids were fine. My wife was still near hysterical but in a pleasant way. My aunt was wondering whether or not she would make it to her next birthday (which happened to be the next day). I announced proudly that a precedent had been set and that we should do this length of walk more often. My wife fixed her steely glare on me. For someone near hysterics she had remarkably good composure when it came to glaring, and I decided that perhaps we should try something a little shorter next week. This entry was posted in Kent and tagged Allhallows, Cliffe, coast, Hoo Peninsula, Kent, travel, walking. Bookmark the permalink. As the aforementioned ‘Aunt Jenny’ acompanying family on Cliffe to Allhallows Walk – I now suspect Nephew Nic of planning my early demise!. This gentle coastal ramble turned out to be 14.37 miles!!!. This will take more than a reviving ‘Gin & Tonic’ !!! .Fortunatley I survived to my birthday the following day – and will expect a large present by way of recompence. Am already planning a suitable revenge!!! Jenny – All I can say is that I do not believe I have ever seen you more happy than when you had two boots full of water and were lying face down in the mud after having just tripped up in the marsh after walking 14 miles. I could tell you were happy because you sort of just lay there, unmoving, in your element, revelling in silent joy, as Deb stood next to you figting back her hysteria. Wow! That was a long walk to try with your children. Well done to all of you. I remember that section well. Like you, I got thoroughly lost in the marshes and thought I was never going to get out of the boggy ground. 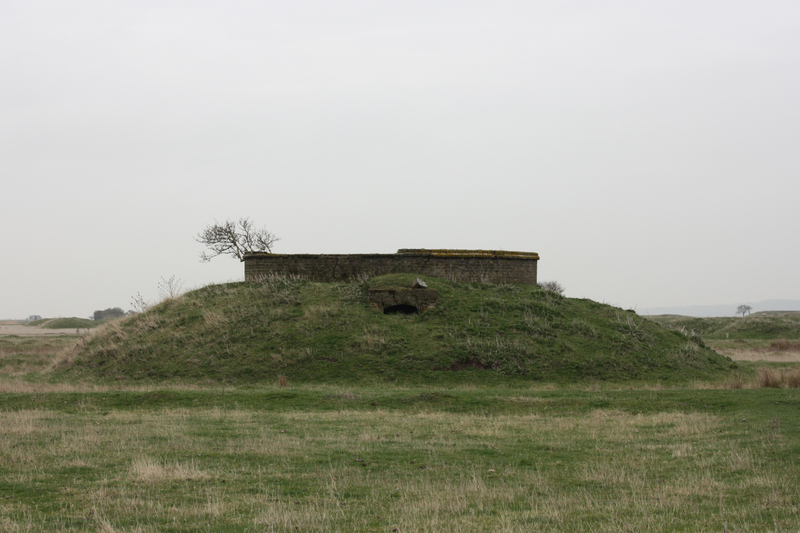 And found the same pillbox. And ended up at the same pub! Don’t want to depress you, but I found the next section very tricky. Few footpaths and lots of mud. Thanks Ruth – I am heartily encouraged at facing next week’s walk! I think we will be attempting to follow in your footsteps, so long as those footsteps aren’t sunk too deep into the knee-high mud you describe and full to the brim with water! Surely if we’re all facing a hosepipe ban it can’t be too wet and muddy……can it?? Whilst approving of the distance covered & the foresight to finish at a decent pub I must say that the prospect of a ‘bog slog’ if I am not climbing a mountain to be rewarded with a spectacular view is not appealling. I will therefore defer considering a return guest appearance for a couple of weeks pending more attractive reports on the terrain. Mark – Come on – that’s unfair! We had great views to the caravan park as we crossed the bog! You are welcome to join us any time…. Thank you! I still remember trying to navigate that section! Off to do this walk today, I’m sure will end up in the same Pub!!! No not the best Pub to say the least, but the beer was especially good after the hike! Best path over the saltings is close to the sea, if tide out can walk on beach, public foot path ends mid saltings and a big gulley in the way. Would need more than a plank to cross Lol! Yes I thought it very convenient that the path just filtered out into nothing but mud! 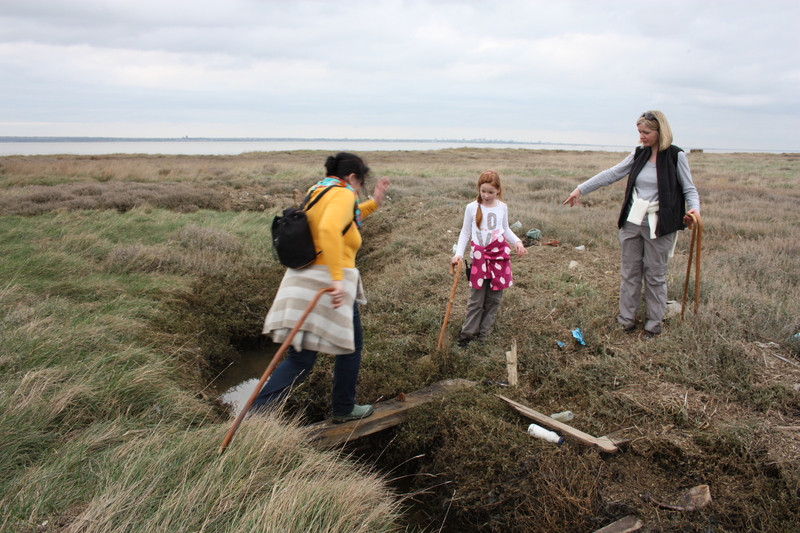 After 13.5 miles we thought it would be a quick nip across the saltings to reach journey’s end. An hour or so later we just about got to the end!